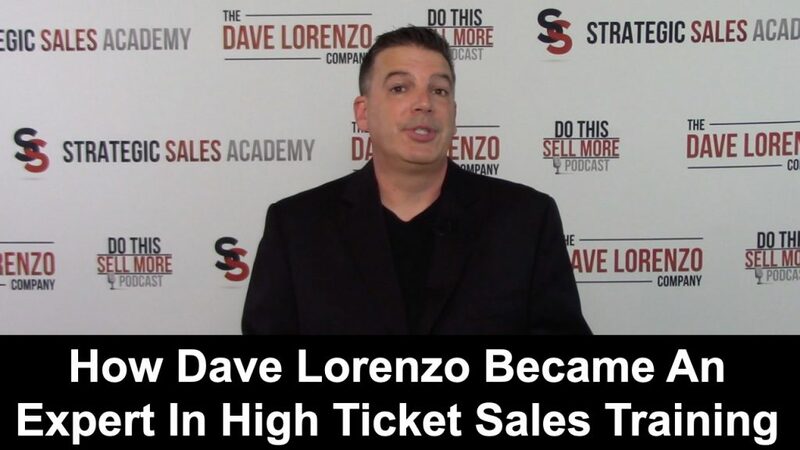 If you are wondering how Dave Lorenzo became an expert in high ticket sales training, this article and video will provide you with an overview of my story (I’m Dave Lorenzo). This video is the story of how I got into sales and became an expert in high ticket sales training. Because I wasn’t born into a high ticket sales role. Quite the contrary, I was focused on smaller work with companies that were well below the level of the Fortune 500. One day the CEO of our company walked into my office and asked me for a favor. He asked me to go after a specific account – one our firm had lost to his former brother-in-law. The CEO stressed the importance of winning back this account and even offered me a bonus to get it back. Keep in mind, this was a publicly traded company and one of the largest retailers in the United States. With my CEO’s deadline firmly fixed in my mind, I went to work trying to establish relationships with people in that company. I Wass able to find someone who had been to one of my events and knew me and my work, so I reached out to her. Once I discovered what motivated her, I was able to help her raise her profile in the company and get a promotion. The eventually lead to me winning the business back from our competitor. How is High Ticket Sales Different From Relationship Sales? In this case, I shortened the sales cycle and closed a million-dollar deal in a short period of time. I did it because I helped the client succeed. It is easier to close a big deal with you have a relationship (or relationships) with people inside the client company. You need several people advocating for your service (or product). Relationships are the foundation for high ticket sales. They are necessary. Think of your relationships with people as investments of trust. The more you invest, the greater the dividend. High ticket sales is no different than selling lemonade on a street corner. If you want your client to buy 10 glasses of lemonade instead of one, you need to present the value of the thirst-quenching opportunity to your client AFTER you’ve built up your relationship with him.